Each of the 15 federal departments (and the hundreds of federal agencies) has its own mission, personnel, and operating procedures. But that does not mean that these separate entities operate with no knowledge of what the others are doing or no interest in seeing that their sister agencies achieve their statutory and discretionary objectives. In fact, federal agencies have a long history of developing memorandums of understanding (MOUs) with one another. MOUs can cover a broad range of topics. For example, agencies may commit to checking with one another before developing regulations to eliminate or reduce duplication, share staff or other resources, and also share information. One type of information sharing that should be of special interest to employers is OSHA’s receipt of potential worker safety violations forwarded by inspectors from other agencies. OSHA, in fact, has a website that lists 45 MOUs with its sister agencies, including five with the EPA, the most OSHA has with any Agency. One MOU between OSHA and what was formerly called EPA’s Office of Enforcement that was issued in 1991—and, apparently, is still in effect—is intended to aid both agencies in “identifying environmental and workplace health and safety problems and to more effectively implement enforcement of our national workplace and environmental statutes” (https://www.osha.gov/pls/oshaweb/owadisp.show_document?p_id=237&p_table=MOU). The MOU states that the EPA and OSHA may conduct joint inspections in accordance with an annual joint work plan that identifies areas for joint initiatives. Such inspections may also be scheduled on an ad hoc basis, such as in investigations following accidents or fatalities or injuries to workers resulting from reported activities or situations subject to either EPA or OSHA jurisdiction. OSHA and the EPA shall develop a regular system to track and manage referrals of potential violations, allegations of violations, or situations requiring inspection, evaluation, or follow-up by either agency. Although the EPA does not conduct inspections for occupational safety, in the course of an EPA inspection, EPA personnel may identify safety concerns within the area of OSHA responsibility or may receive complaints about the safety or health of employees related to their working conditions. 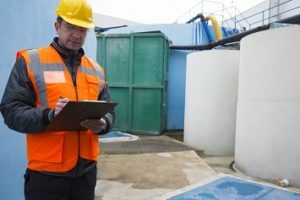 While EPA inspectors are not to perform the role of OSHA inspectors, the EPA will bring the matter to the attention of OSHA-designated contacts in the regional office. In the case of worker complaints, the EPA will disclose the name of individuals to OSHA but will not further disclose the name and the identity of the employee. Accidental, unpermitted, or deliberate releases of chemicals or chemical substances beyond the workplace. The EPA shall respond to referrals from OSHA, and OSHA shall respond to referrals from the EPA, concerning potential violations of the other agency’s requirements, when appropriate, by conducting investigations in a timely manner. OSHA will work to facilitate referrals of potential violations of EPA regulations to the EPA and will encourage the relevant state agencies in those states that operate their own occupational safety and health programs also to make such referrals. The EPA will work to facilitate referrals to OSHA or OSHA state-plan states of potential violations of occupational health and safety standards or regulations discovered by federal or state environmental inspection activities. The EPA and OSHA will conduct periodic meetings, as necessary, to report on the progress of actions taken on the other agency’s referrals and to evaluate the effectiveness of the referral system and operating procedures. Both agencies agree to establish a system to monitor the progress of actions taken on referrals. OSHA will encourage state-plan states to respond to referrals from the EPA and state agencies concerning potential violations of the states’ occupational safety and health standards or regulations by conducting investigations in a timely manner. Viewing the EPA-OSHA MOU specifically, and all OSHA MOUs in general, the message for employers is that an inspection by any government entity, including state and local agencies, has the potential to bring a regulatory violation in any area to the attention of the agency with oversight of that area.